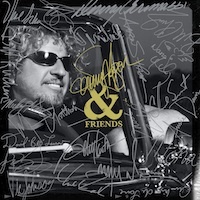 With a long musical career under his own name and together with Van Halen and Chickenfoot, the American wild head Sammy Hagar has entertained me and when I heard about this new album I had quite big expectations. I saw Mr. Hagar live with Chickenfoot in Kilafors in 2009 and that was one of the best shows I've seen in my lifetime. The rain was pouring down and it was cold and chilly, but Sammy & co made the crowd sweat and dance all night long. A true showman on stage. Anyhow, this disc is a diverse and different album with songs that spreads from slow American blues songs to modern hard rock. The first two songs are very bluesy tracks that I skipped. I was surprised that I got stuck at the cover of Depeche Modes old hit "Personal Jesus" which Sammy has made something extraordinary with his mates: Neal Schon, Michael Anthony and Chad Smith. It's followed by the poppy and naive tribute to the sun, "Father Sun", a song written by Sammy himself where he also gets help from his son Aaron on the background vocals. It sounds like Lumineers and a chorus that has a strong reminiscent of parts of the Beatles' "Here Comes the Sun". "Bad on Fords and Chevrolets" is probably the song I like best on this disc. 'Margaritaville' is a cover of Jimmy Buffet's old blues hit. A good summer party song btw. Sammy sings duet with Nancy Wilson in "All We Need is an Island", which is a 'Hawaiian-country' track?! I don't know how I can sort this album out really and the few highlights can't save this album from my axe. I'm waiting for the next Chickenfoot album instead, because there is too much country and blues on this album for my taste.